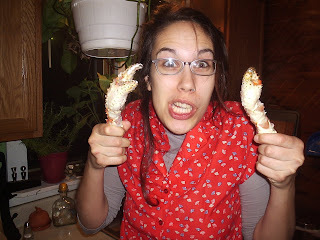 Everything Nice: Who's Got Crabs? 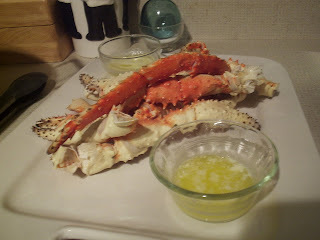 Unlike the snow crab Tony and I made last time (my first time eating crab), the king crab we made this time has pokey legs, and we had to use pliers to crush them. To accompany the delicious sea creatures, we roasted some buttercream potatoes, carrots and onion with some olive oil, salt, pepper and sage. It was a lovely meal--as you can see. And I'd like to make a shout out to the ceramic peeler. Go out and get one if you haven't already. 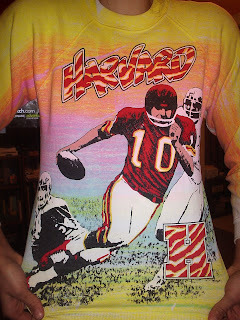 And on a completely unrelated note, I found a lovely, Technicolor Harvard dream sweatshirt at the Family Thrift Center today, and I think I'm going to send it to my cousin Nora (who attends said University) and let her do with it as she sees fit because it is a glorious thing to behold. Doug & I have started a tradition of making crab legs on New Year's Day... 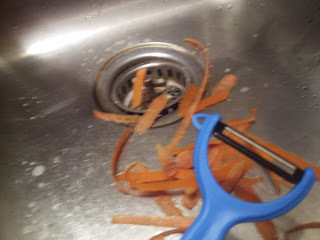 Kitchen scissors are the BEST tool for getting to the juicy flesh quickly!